International traveling exhibitions that featured Judy’s work. 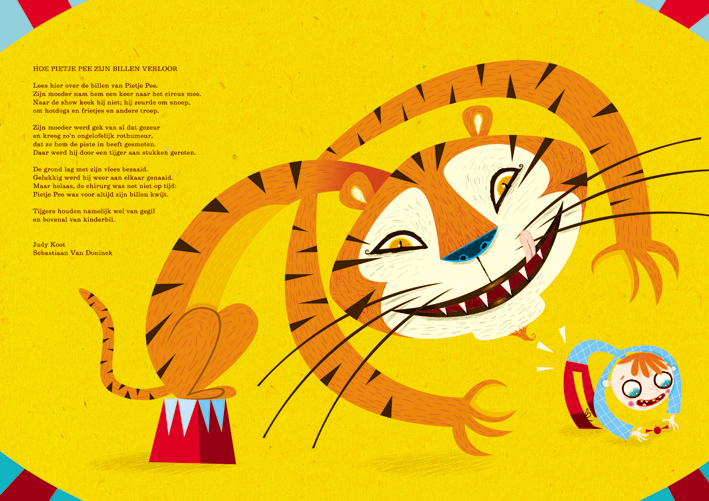 The children’s poem “Hoe Pietje Pee zijn billen verloor” (How Pepe P. Lost His Buns), illustrated by Sebastiaan Van Doninck, traveled through Europe as part of Poem Parade, an international poetry exhibition for children. In the Netherlands the Parade could be seen at literary venues like public libraries, and museums like CODA Arts in Apeldoorn, the Museum for Communication in The Hague, and the National Education Museum in Rotterdam. The circus-themed exhibition showcased work by poets from several countries, illustrated by different artists. In 2003 the illustrations for Judy’s children’s picture book Het huis van Lotte Hanoeman (The House of Lily Hanuman) were selected by, and exhibited during BolognaFiere (International Children’s Book Fair Bologna, Italy), and then traveled to Japan where they were exhibited in several museums, like the Itabashi Art Museum in Tokyo. The contemporary collage-style illustrations were done by children’s book illustrator Willeke de Boer under Judy’s art direction.